Ever find yourself getting bored of the same old breakfast routine? I have a pretty solid rotation of about 7-10 things we feed our 5 kids for breakfast...but beyond that, I'm kind of at a loss. Thankfully, my friend Liz Weiss of Liz's Healthy Table recently whipped up an awesome breakfast boredom-buster with her new Fluffy California Avocado and Ricotta Pancake Recipe. Here are Liz's gloriously fluffy pancakes, photos courtesy of the great creator herself! Liz and I have both been nutrition spokespeople for the California Avocado Commission...and we've been bonding over our love of avocados for years now. I've passed that avo-love along to my babies, and we put down some serious California fruit in our house when these beauties are in season! Liz recently invited me to be on her podcast Liz's Healthy Table to talk all about baby-led weaning, and you can check out the episode here. We chatted about the best ways to get started with a baby-led approach to feeding, and I shared some of my favorite baby starter foods...including, of course, avocados. So back in the kitchen...I've been making Liz's fluffy pancakes recipe for awhile now, and I have to say it's become a standby in our morning routine. You'll love how easy they are to throw together, and they're one of those delicious recipes that your whole family is going to love. Special thanks to the California Avocado Commission for sponsoring this episode of Liz's podcast. You can get tons of great avocado recipes over at their website here. Thanks to Liz Weiss of Liz's Healthy Table for creating this amazing recipe with the support of the California Avocado Commission. Liz says, "Avocados add a natural lusciousness and creaminess to these pancakes and the bananas add natural sweetness. Together with the oats, they bring 3 grams of fiber to every serving. There is so much goodness in this recipe besides the fiber including calcium, folate and iron. If you have babies at your table, they'll probably eat one or two pancakes. If you have teenagers at your table like I do, they will probably eat half the batch!" Place the banana and avocado in a large bowl and mash with the back of a fork or a potato masher until smooth. Whisk in the egg, ricotta cheese, milk and vanilla extract until well combined. In a separate bowl, whisk together the oats, cinnamon and baking powder. Stir the oat mixture into the avocado mixture until combined. Let stand 10 minutes. Lightly oil or coat a large nonstick skillet or griddle with nonstick cooking spray and heat over medium heat. Pour the batter onto the hot skillet 2 heaping tablespoons at a time, forming 2-inch pancakes. Cook until the bottoms turn golden, about 3 to 4 minutes. Flip the pancakes, and cook until the other sides are golden, an additional 3 to 4 minutes. Adjust the heat as you go if the bottoms brown too quickly. Repeat with the remaining cooking spray and batter. Allow the pancakes to cool slightly. Cut each into four half-inch “sticks,” and serve with slices of banana and avocado. Being the super-dietitian that she is, Liz even provided a full nutrient analysis of the pancake recipe she created! OK, but can I brag a little bit more about the creator of this recipe, Liz? She is the author of 5 cookbooks, a food blogger, media personality and an amazing food photographer (check her out on instagram over @lizweiss for some truly mouthwatering food photos). For years she reported on nutrition and health for CNN and has been featured on The Today Show, CNN Headline News and the Food Network. One of the reasons why I am so inspired by Liz - both as a nutrition professional and a busy mom, is that her real food philosophy is all about adding food groups to your diet - not taking them away. She despises deprivation, craves simplicity and does an incredible job of incorporating easy-to-find everyday ingredients that make mealtime a breeze. 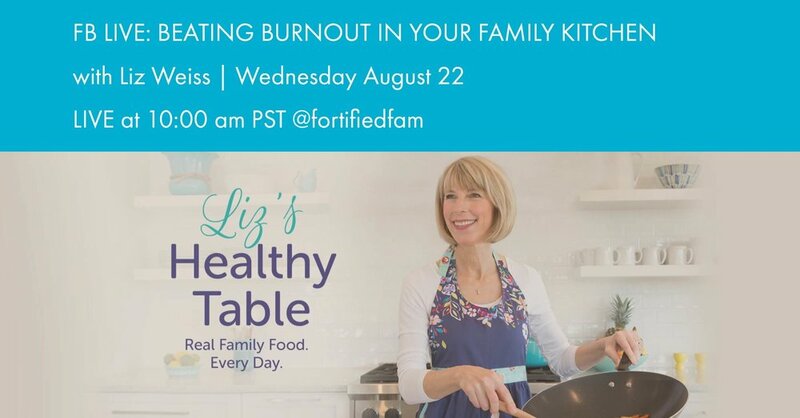 So I'm super excited to have Liz on my weekly liveshow "The Fortified Family Foodshow" to talk all about preventing burnout when it comes to family meal prep. You guys know that as much as you might love cooking and preparing meals, it’s a grind to stay creative and cheerful and innovative when you’re trying to put together wholesome and healthful meals for your family day in and day out. Click below for more info on the liveshow, and in the meantime, check out Liz's Healthy Table on Facebook for some more insanely easy recipes that will help YOU beat burnout in your family kitchen!